Bayview Vacation Home in Homer, Alaska invites you to experience unobstructed panoramic view. It sits atop a hillside overlooking downtown, Beluga Lake, Homer airport, Kachemak Bay, the Spit, Kenai Mountains and beautiful glaciers. The view from our home is very colorful, inspiring and ever-changing. Snow-capped mountains, green forests, glowing yellow meadows during sunset, and a sea of clouds along the blue bay are just some of the stunning views you can see during the day. At night, you can see the street lights sparkling on the Spit and the town. Even during rainy days, you will enjoy enchanting views of reflecting water droplets. Our home was custom built in 2003 and faces nearly one acre of wild flower gardens. The house has a living area of 3,200 square feet, divided into upper and lower levels. In the upper level, the living room has vaulted high ceilings and huge panoramic windows built into the entire front wall. The windows allow you to soak in the views of the curved Spit, mountains and gleaming glaciers formed across the bay. The master bedroom has one queen bed and one full bathroom equipped with a Jacuzzi bathtub. You can walk to the deck from the master bedroom or just lie down on the bed to enjoy the beautiful view. The second bedroom has one queen size bed and one window. There is also one sofa bed for extra visitors and another bathroom near the entrance. Visitors sleeping on the sofa bed will feel like they are being embraced by the mountains in the dimming sunset. The spacious kitchen and dining area has a sliding door which leads to the deck. Additionally, the upper level is equipped with a washer and dryer for your convenience. For privacy, a separate entrance deck leads to the lower level. There is also an indoor stairway leading to the lower level. The lower level has a living room with big windows overlooking the view and it contains two big bedrooms. One room has one queen-size bed and the other has two full-size beds. Both rooms have large windows to view the Spit and Kenai mountains. The lower level kitchen and dining area was newly built in 2008. The kitchens in each level are well equipped with all the necessary amenities for you to enjoy cooking and dining. We purchased this lovely home in 2008 for our retirement and furnished it with the finest new furniture for your comfort. We also provided two 42” wide-screen HDTV, high speed internet, and cable/satellite TV for your entertainment. Our home sits on a private street where you can enjoy the serene wilderness, but easily get to town and the Spit within a few minutes drive. Our house is the best for you to enjoy your vacation in Homer. Here are the features which you can not find from other places. 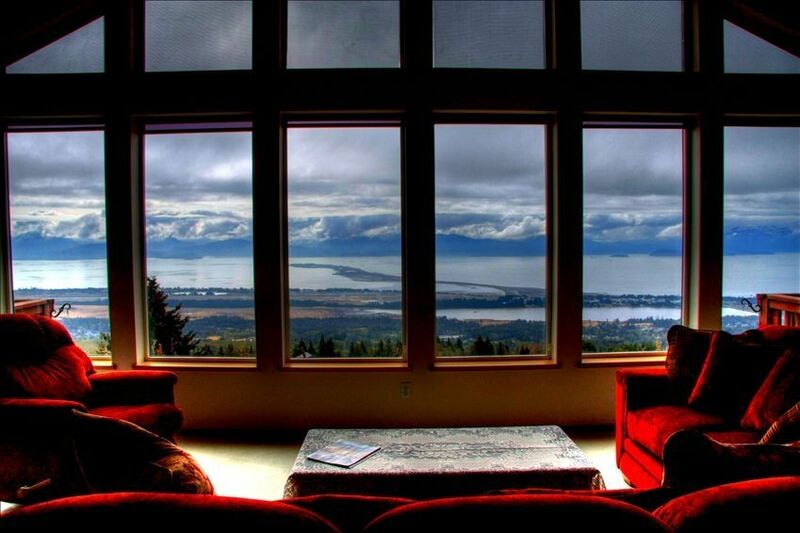 * Million-dollar's panoramic view, overlooking the Spit and Kachemak bay. * A few minutes to the town, restaurants, Spit and etc. * Two big living rooms and two complete kitchens and dining areas. Very spacious. * Comparable rate but more luxurious in prestigious location . We had a combination of three families staying in the house together and it worked perfectly! The house was clean, plenty of room for everyone, and stunningly beautiful. What a great house! My family stayed here including my brother's family and parents on a great Alaskan getaway in August. The house is well set up with linen, towels, utensils and cooking items. The two separate kitchens came in handy when trying to leave early in the morning with large groups to get out the door. The views are epic! I would sit and watch them with family, talking for hours and not get bored. All in all a great VRBO and Robin was always quick to answer questions and try to be accommodating when they could. Thank you for sharing this amazing house with me and my family! If we ever go back to Homer, we will book here for sure! The views were so great I didn’t eat anywhere else in Homer except on the deck overlooking the bay. The house was clean and furnished with everything we needed for a great stay. Everything worked, the bedrooms all had great views except one (which was fine) I stayed with my three sons and brother. There was more than enough room. Will definitely stay there again. Plenty of room for our family and the kitchen had everything we needed. The views from the house are difficult to put into words. We had bald eagles flying over each day and one day had a bear run across the road. Homer is a great little town and so much to see and do. Everything was wonderful. The only complaint I have is the growth outside the bottom floor was obstructing the view somewhat. The house was clean, the beds were comfortable. We enjoyed our stay!!! Family and I all thoroughly enjoyed the home with great views and a well kept home. Yard could use some maintenance, but otherwise a great location to stay at. For the separate units (can be reserved 30 days before check-in), plus $150 cleaning fee Upper unit: $400 per nt up to 4 pp Lower unit: $300 per nt up to 4 pp $20 per night per additional guest Cancellation Policy: Reservation canceled before 60 days prior to check-in, a refund will be issued less one night rental charge. Cancellations made less than 60 days does not warrant any refund of deposit unless re-rental.